Raboy is explaining the reason behind his choice of setting for his latest composition, The Beatitudes. The 40-minute cantata based on Matthew 5 was written for choir, orchestra, and three soloists, and will have its debut during PUC’s Homecoming Weekend in honor of Paulin Hall’s 50th anniversary. Primarily a pianist, Raboy began his love affair with music at the age of five, when his sister began taking lessons. His father was the son of immigrants who believed to be American, you had to educated, and you had to study music. “We begged and begged our dad to buy a piano for the house,” Raboy recalls with a smile. Though Raboy’s father finally agreed, he would only do it if both Raboy and his sister signed contracts saying they would play through high school and practice 30 minutes every day. “I was five,” Raboy reiterates. “I couldn’t read, and I couldn’t write. But I made my mark on that paper, and my dad held me to that contract. If he thought I was going to be a professional musician someday he never would have done it,” he adds with a laugh. The second major musical event in his life took place when he was in third grade. He was having trouble reading, but Raboy’s dad knew he liked music, so he gave him a children’s book called All About the Symphony Orchestra. The last page in the book is an excerpt of a Brahms symphony score. Raboy had no idea what he was looking at, so he took the book to his father and begged him to help him find a way to read the score. By the time he was in sixth grade, Raboy was conducting the elementary school band, as he was the only student in the school who could read scores. Raboy earned his bachelor of arts in music at Binghamton University in New York, then went on to achieve his master of fine arts degree from Carnegie-Mellon University in Pittsburgh. 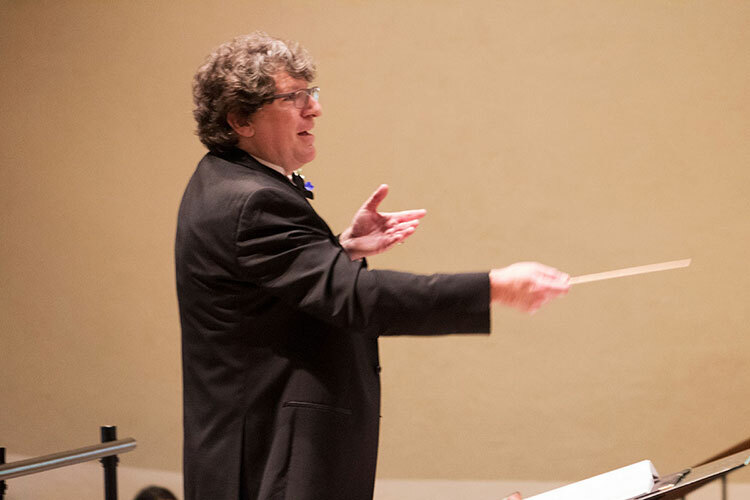 Since then, he has held positions of assistant conductor, co-director, conductor, music director, executive director, resident artist, guest conductor, and more for various philharmonics, orchestras, symphonies, and theater companies across the country, from New York to California and various places between. This includes a 20-year tenure as the music director of the Napa Valley Symphony in California, and his now-11 years of teaching and conducting at PUC. An avid composer, Raboy’s achievements include 29 orchestral arrangements, nearly a dozen wind ensemble pieces, and dozens more original chamber music, vocal solos, choral pieces and arrangements, and stage works. Right now, though, Raboy is just looking forward to hearing his latest composition, The Beatitudes, composed in a mere four months at the end of 2017, performed for the first time. The performance will feature the PUC choir and orchestra, both including alumni and community members, and will highlight guest soloists. The concert will take place in Paulin Hall at 4 p.m. on Saturday, April 21. Admission is free.